Small Bevelled Brass Briefcase Hasp. 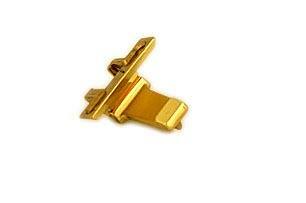 This is our most popular small solid bevelled brass briefcase hasp. It is an appropriate replacement catch for many briefcase key/ combination locks however, do check dimensions and detail closely, as slight differences in design may mean certain spares won't work with your briefcase.